In December, Proz, the chairman of San Japan 1.5 in San Antonio, Texas, extended an invitation to me to attend his convention as a guest. I was thrilled by the offer since I had never been to Texas before. 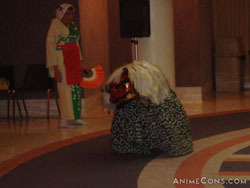 I had been close to visiting Texas when Anime Matsuri invited me to Houston in 2007. However, as it was widely documented, I didn't end up going after they stopped replying to my e-mails and just ignored me, even though my event had been listed on their web site the entire time. The whole experience left a bitter taste in my mouth (and, yeah, I'm still bitter). It was actually this trouble that got me invited to San Japan. Proz wanted to make it up for me on behalf of the people of Texas. 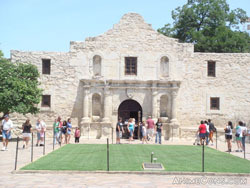 I arrived in San Antonio on Thursday afternoon. My first impression was that it was HOT. I was born and raised in Maine, so I can only recall one day in my life when I had experienced a three-digit outside temperature. It wasn't pleasant. I was now in a place where temperatures around 100° F were considered normal. Fortunately, as the saying goes, "It's not the heat, it's the humidity." I'd happily endure the 100° heat of Texas over the lower temperatures and oppressive humidity that has become synonymous with another convention which was held the same weekend. I checked in to the El Tropicano Holiday Inn and put my feet up for a little bit. I had been awake since 4am EDT in order to get my 6am flight from Boston. It was routed through DC and Dallas on the way to San Antonio, so I was definitely exhausted. After resting for a bit, I decided to explore the hotel. San Japan had its programming divided between the hotel and the San Antonio Municipal Auditorium around the corner, just a five minute walk away. I'm used to conventions in the northeast and usually see a lot of familiar faces. Some of those faces I know, others I recognize as regular convention goers. Here, however, every face was completely new. As I explored, that's when it hit me that I didn't know anyone here...until I spotted Christopher Ayres. Chris and I met at Anime Boston 2008 in March where he was a guest and I was on staff as a guest liaison. He introduced me to the other voice actor guests who were present: Hannah Alcorn, Josh Grelle, and Carli Mosier. The staff had booked a boat ride down the Riverwalk through the center of San Antonio. All guests who had arrived by Thursday evening were invited, so I got to go along. Our boat pilot was entertaining and we got a good look at the city from the canal system that runs through the center. After the boat ride, we hung out at the hotel's Tiki Bar for a little while. (Fans of Tiki Bar TV will be disappointed to hear that Dr. Tiki, Johnny Johnny, and Lala were nowhere in sight.) After one drink, I realized I had been awake for around 22 hours, so I called it a night. On Friday, I didn't have anything scheduled until Anime Unscripted at 10pm. This gave me the opportunity to catch up on sleep. After sleeping in a bit, I headed over to the auditorium and checked out a few panels. Before long, I got a bit hungry and decided to take a stroll downtown to explore the city a bit while finding something to eat. Not being too familiar with the city, I just walked in the general direction of the center of town. 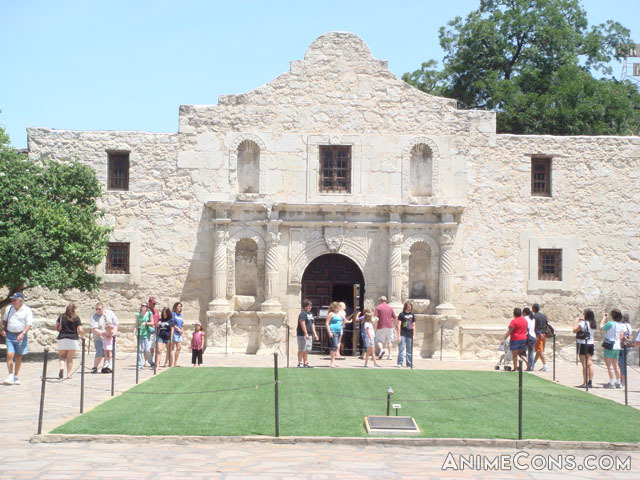 Upon turning a corner, I found myself face to face with The Alamo. Since I hadn't gone looking for it, I was surprised to come across it so randomly. After a bit of exploring, I headed back to take in some panels and check out opening ceremonies. 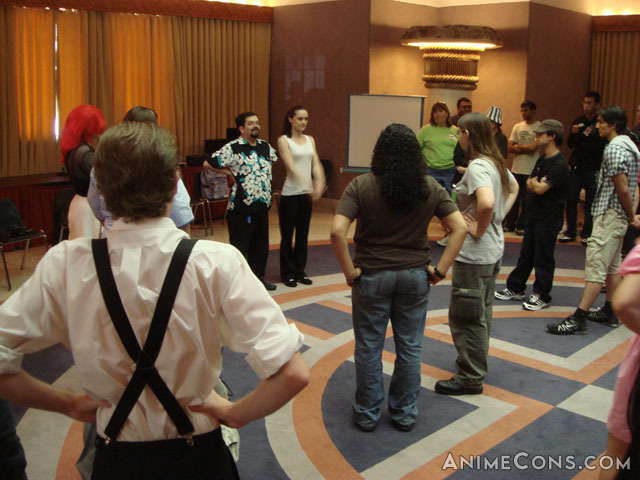 That evening, I explained the rules of the Anime Unscripted games to the guests in the green room before heading over. This was the 24th time I hosted the improvisation event. While I usually have a group of four performers, this time I had all seven voice actor guests participating. As the host of the event, it was a bit of a challenge to make sure that everyone got to participate in about the same number of games. In the end, everyone had some shining moments and it was a lot of fun for the audience as well as those of us performing. The next day, I arrived at the auditorium and watched Chris Ayres run his Mock Combat for Cosplay workshop. It teaches cosplayers how to safely perform stage fighting techniques. The moves looked very realistic and believable, as if everyone was torturing each other, but it was all completely safe and there were no injuries. What amused me most was seeing a Doctor Who cosplayer appear to be beating up someone else and then be on the receiving end of the beating. Following the workshop, I took some time to check out the dealers' room and artists' alley before heading back to the hotel. At the hotel, I got the necessary materials for my next panel: The Chibi Project LIVE! The Chibi Project is a web site where we destroy toys for our own amusement. Two years ago, we began publishing a video podcast with footage of our experiments. Since then, we've conducted several live panels at conventions and have destroyed a toy in front of people and published as an episode of The Chibi Project podcast. 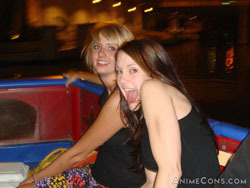 Our San Japan episode will be published on August 20th as episode 15. If you want to see what toy we destroyed or how we did it, you'll have to tune in then. The podcast is a free subscription in the iTunes store (search for "Chibi Project") or visit chibiproject.com for other viewing options. An hour after The Chibi Project panel, I was invited to sit on a panel discussion about the current state of the industry. Although I am not involved in the production of anime, I was able to offer insight into the role conventions play. Chris Ayres spoke about the production side while one of the dealers offered his take on bootleg merchandise. He presented a licensed version and a bootleg version of one plushie and challenged people to pick the bootleg. Although they were close, he pointed out several things which indicated which was the bootleg. That evening, I had the opportunity to introduce several people to Dr. Horrible's Sing-Along Blog. I still get songs from that going through my head. Heading up to my hotel room, I watched some Olympic coverage on TV and talked with one of my two con roommates, Sky Pirate, for a bit. Sunday morning, I packed up my stuff and dropped it off in the green room. It was my last day at the con, but I was still having fun. I headed over to the auditorium to present my All About Anime Cons panel, but found a Japanese dance demonstration scheduled before me was running long. Apparently the woman running it had arrived very late, but I was assured that I wouldn't have to wait much longer. I finally could get the panel rolling at 15 to 20 past the hour. 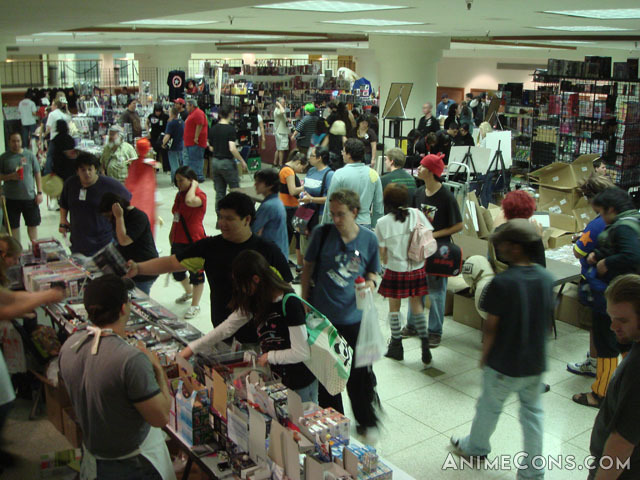 In my All About Anime Cons panel, I explain what it takes to get an anime convention off the ground. Although there's certainly no single right way to start and run a convention, but I hoped that my insight would help would-be conchairs of the future. Of course, the overall message of the panel is not to even think about starting an anime convention unless you're absolutely sure you know what you're doing. With just a couple more hours before I had to head to the airport, I took one last spin through the dealers' room and artists' alley. After completing my shopping, I headed up to the green room to say goodbye to some staff. I had thought the trip back would be rather uneventful, but it wasn't. I arrived in Dallas where I had a connection to Boston. After checking the board to learn my flight had been delayed, I posted about the delay to Twitter. Putting my phone away, I looked over at the terminal window and spotted Alex Albrecht of Diggnation, The Totally Rad Show, and Project Lore. He was playing on his Nintendo DS Lite next to Dan Trachtenberg and Jeff Cannata (also of The Totally Rad Show). I walked over, introduced myself, and talked with them briefly. After handing them some Chibi Project DVDs, I went off to get some dinner at Chili's...and then kicked myself for not getting a photo. After having a week to reflect on it and how it performed as a first year convention, I came away from San Japan quite impressed. I kept thinking of it in comparison to Anime Boston 2003. While Anime Boston's first year is often the exception to every rule of first year conventions and probably not something other conventions should use as a model for their first year convention, it was considered to be very successful. It brought an anime convention to a region that had not previously had one. 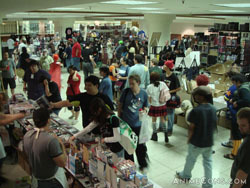 San Japan accomplished the same by holding a successful convention in a location in which there had never been one before. There were a total of 3,523 people at San Japan, which is amazing for a first year convention. From what I witnessed, most people seemed to be having a great time. I'm sure word will spread quickly as to the success of San Japan and the convention will continue to grow for years to come. If you're an anime fan in the San Antonio area, you need to go to this convention. The staff did a wonderful job planning it and I'm sure they'll build on their experience and manage to make San Japan even better next year. View photos from San Japan. 1) That IS one of the honest to God reasons that I was invited to San Japan...as goodwill on behalf of Texas. 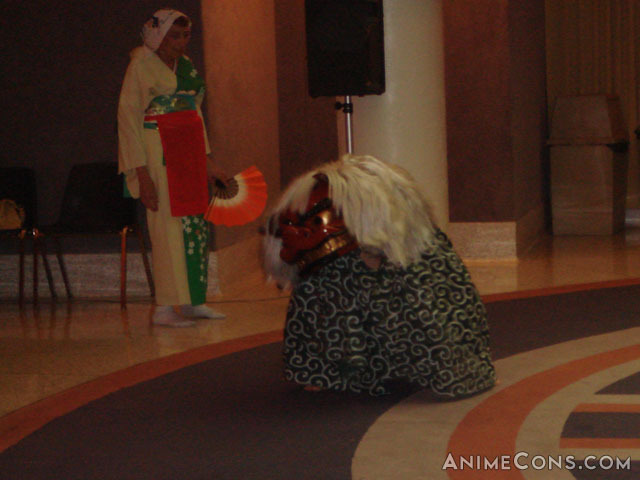 2) This post on the forums is the first apology of any kind I ever got from any Anime Matsuri staff member. It was a year and a half late. 3) With this article being completed, I'm pretty much done bringing up the Anime Matsuri issue...so I very likely won't be bringing it up again. I only brought it up in this article because it was relevant to my San Japan experience. I'm really glad that you had a good time, Patrick. It was an honor to meet you, and I'm glad you survived our August heat. good on san japan for having such an awesome con! pat do you notice any different trends in the costumes...with it being so hot people might want to use different materials or go for different characters. is the amount of cosplayers less as well...just curious. being from new england i hate anything 90+ myself for temp. Seems like theres a lot to see in san antonio to be a tourist as well, not always true for some of the more regional cons. Sounds like it was a lot of fun! Different cons are always an adventure. 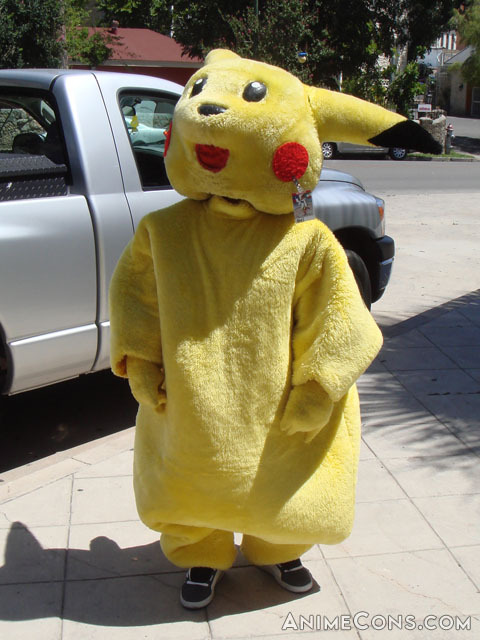 I try to go to one different con a year, and although Costume Con will be different and awesome, I still want a different anime con to go to. Yeah, it definitely helps if the convention's located in an area where there's other stuff to see and do within walking distance. Going to a con and being stuck out at a Best Western by the airport in a small town certainly has fewer options available. Yeah, I like going to some new cons every year too. I has given me a chance to check out Nan Desu Kan, Anime USA, Tsubasacon, Animaritime, Anime Weekend Atlanta, and others. I know I'll be checking out some others for the first time next year too. I will admit I'm jealous of you going to blizzcon this year as well. although I have left World of Warcraft behind a couple years ago, I respect blizz as one of the premiere gaming companies in the industry. That con is gonna be some great fun...seeing whats going into the swag bag is going to be great as well. I'd like to work up my blog into something that would gain me enough repute to gain a press pass to these things, but it's so hard just finding the time. Sounds like a fine event for a first year convention. Glad you had a good time in Texas. That con is gonna be some great fun...seeing whats going into the swag bag is going to be great as well. Yeah, I could probably eBay the stuff and pay for my flight...but I'm keeping it. I didn't get a press pass to Blizzcon. I spent two days fighting their overwhelmed ticket purchasing system and paid $100 like everyone else. I considered it, but decided not to risk finding out what would happen. I spent six long grueling weeks in San Antonio. I learned in a hurry that you Don't Mess with Texas. I hope never to go back there ever unless its for a Anime Convention then I will think about it. Wow! I'm sorry I missed it. But living up in PA does that sometimes... maybe you should come back for Ikkicon, in austin, in february. >_> *eyes mike* LOL. I lived in austing for 18 years and 6 months... and yeah... it's the humidity. D: But it makes any other amount of heat bearable, unless you go to florida, then you're drinking the air. Least, that's what my eldest brother tells me. Don't mess with Texas. Because we have Vic Miognogna, Chris Ayres, Greg Ayres and the rest of the ADV/Funimation Voice actors. xD Tho, some of them are also in california... but... meh. LOL. Thank you for everything, Patrick. I do want to mention that you got a review about your panel at San Japan. That's awesome! Thanks for the link!